To conclude what has been a successful year of events, rallies and vigils, the UGA chapter of National Association for the Advancement of Colored People will be holding a ceremony to honor the top leaders, faculty and organizations on campus. 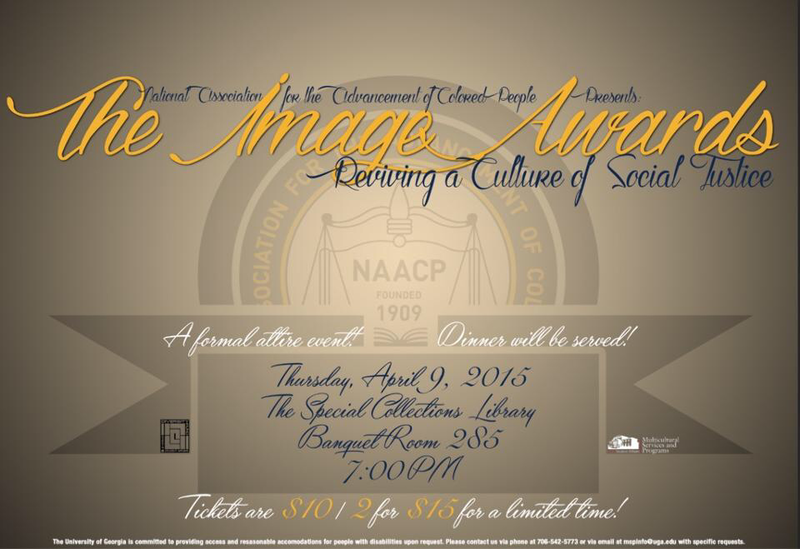 On April 9th, 2015, NAACP will be hosting their 2015 Image Awards. These image awards are a celebration of social justice, achievement, and unity among the community. The award ceremony will feature over 15 awards focused on criteria based on leadership, scholarship, unity, and social justice. The award selection committee will feature seven members distinguished members of campus leadership. The event will feature a keynote speaker to be named later. Tickets will begin going on sale this Wednesday, March 4th and will be $10 person and a special 2 for $15 promotion for a limited time. Tickets can be purchased at Tate Box Office. Dinner will be served to all who attend; there will also be a red carpet, photo back-drop and professional photographers to capture the moments of the evening. Though the committee will be selecting the majority of awards, there is a special way for students to be involved this year. The top student award, Male/Female Outstanding Campus Leader, will be given to a student who has exemplified excellence in the classroom, campus and community. Once narrowed down to five individuals for both awards, students will be able to vote for who they feel embodies these characteristics the most. A poll will be uploaded to our website (eliteuga.com) where students can cast votes. For all of the awards presented that evening, anyone can nominate a faculty member, organization or student. The link to nominate is https://ugeorgia.qualtrics.com/SE/?SID=SV_bj84tMdYIPFCaxv (this is a preliminary list, the full list will be uploaded at a later date). The deadline to send in nominations will be March 20th. The only criterion to be nominated on is that all nominees must be in good standing with the Univeristy of Georgia and/or a community member in good civic standing. All award winners will be announced live at the event. Once again, the event will take place on April 9th at 7 pm in banquet room 285 of Russell Special Collections library. For more updates on this event, follow @UGANAACP and @UGAELITE on twitter.